Note: This is a re-post and update of a previous article, originally published as a White Paper (PDF). This web page should enable easier linking. Why is social learning important for today’s enterprise? There is a growing demand for the ability to connect to others. It is with each other that we can make sense, and this is social. Organizations, in order to function, need to encourage social exchanges and social learning due to faster rates of business and technological changes. Social experience is adaptive by nature and a social learning mindset enables better feedback on environmental changes back to the organization. We are moving to the world of the sons of Socrates, where dialogue and guidance are key competencies. It is a world where the capability to find information and turn it into knowledge at the point-of-need provides the key competitive advantage, where knowing the right people to ask the right questions of is more likely to lead to success than any amount of internally-held knowledge and skill. Our relationship with knowledge is changing as our work becomes more intangible and complex. Notice how most value in today’s marketplace is intangible, with Google’s multi- billion dollar valuation an example of value in non-tangible processes that could be deflated with the development of a better search algorithm. Non-physical assets comprise about 80 percent of the value of Standard & Poor’s 500 US companies in leading industries. The manner in which we prepare people for work is based on the Taylorist perspective that there is only one way to do a job and that the person doing the work needs to conform to job requirements [F.W. Taylor, The Principles of Scientific Management, 1911]. Individual training, the core of corporate learning and development, is based on the premise that jobs are constant and those who fill them are interchangeable. However, when you look at the modern organization, it is moving to a model of constant change, whether through mergers and acquisitions or as quick-start web-enabled networks. For the human resources department, the question becomes one of preparing people for jobs that don’t even exist. For example, the role of online community manager, a fast-growing field today, barely existed five years ago. Individual training for job preparation requires a stable work environment, a luxury no one has any more. 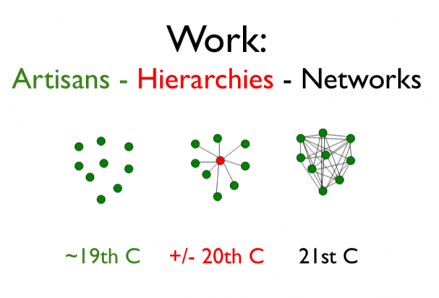 A collective, social learning approach, on the other hand, takes the perspective that learning and work happen as groups and how the group is connected (the network) is more important than any individual node within it. MIT’s Peter Senge has made some important clarifications on terms we often use in looking at work, job classifications and training to support them. Knowledge: the capacity for effective action. “Know how” is the only aspect of knowledge that really matters in life. Practitioner: someone who is accountable for producing results. Learning may be an individual activity but if it remains within the individual it is of no value whatsoever to the organization. Acting on knowledge, as a practitioner (work performance) is all that matters. So why are organizations in the individual learning (training) business anyway? Individuals should be directing their own learning. Organizations should focus on results. Individual learning in organizations is basically irrelevant because work is almost never done by one person. All organizational value is created by teams and networks. Furthermore, learning may be generated in teams but even this type of knowledge comes and goes. Learning really spreads through social networks. Social networks are the primary conduit for effective organizational performance. Blocking, or circumventing, social networks slows learning, reduces effectiveness and may in the end kill the organization.